With their delicate, ornamental designs and romantic motifs, filigree engagement rings are popular with brides-to-be who love exquisitely detailed jewelry. There are lots of gorgeous designs out there, from antique-inspired filigree settings to elaborate modern rings. Before you select one of these exquisite rings, it helps to know a bit about filigree and how to choose a high-quality engagement ring. Filigree is a metalworking technique that usually involves arranging threads and beads of precious metal into elaborate lace-like designs. Common motifs include flowers, vines, hearts, and flourishes. Sometimes, these rings feature additional engraving or small diamond or gemstone accents. Since precious metals are often less expensive than gemstones, filigree is a relatively inexpensive way to embellish a ring. It can add visual pop to a smaller diamond or center gemstone. Filigree is old-fashioned and romantic, giving even a brand new engagement ring a timeless, classic appearance. The intricate nature of filigree ensures that your engagement ring won't look like everyone else's. It's the perfect choice for the bride-to-be who wants her ring to stand out. Investigate the ring selection carefully, particularly if you prefer a unique ring. 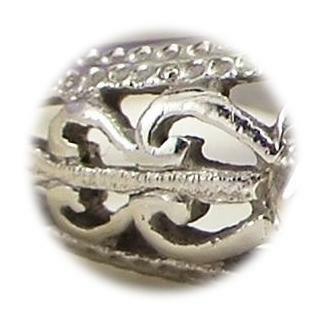 Common filigree designs may be mass-produced and featured on several rings. Inspect your specific ring carefully. Check for the design's symmetry, the sturdiness of the metalwork, and the precision of the pattern. Understand that by its very nature, filigree is delicate. This means that if you catch any openwork on an object, you may accidentally damage your ring. Ask about maintenance and repair. Many mainstream jewelers are unable to work on filigree rings from other artisans, and special arrangements may be required for service. Filigree settings come in all kinds of precious metals, from 24k gold to platinum and sterling silver. If you are choosing a filigree engagement ring that has openwork, it's essential that you consider the durability of the precious metal used in the setting. 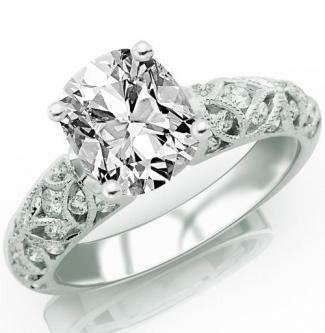 Using the most durable precious metals can ensure your ring is as beautiful 50 years from now as it is today. Platinum - Platinum is a great choice for a filigree design, since it's more durable than gold. However, it's also the most expensive precious metal used in jewelry and may not be in your budget. 24k gold - 24k gold, whether white gold, yellow gold, or another option, is not a great choice for a filigree ring. Gold with a high karat content is very soft, and your ring may be prone to damage. 14k gold - 14k gold in any color is an excellent choice for a filigree ring. Because the gold is an alloy, meaning that it is mixed with other metals, it is more durable than higher karat content options. 10k gold - Gold that is 10k makes an even more durable and affordable choice. You can find 10k gold in a variety of colors that look beautiful in a filigree design. Sterling silver - Sterling silver is also a good choice, since it is durable and can support the delicate filigree designs. It's much more affordable than other precious metals, although some couple don't feel it is special enough for an engagement ring. Metal type is not the only factor that affects the cost of filigree engagement rings. Ounce-for-ounce, a filigree setting sometimes costs more than a simpler counterpart, especially if it is made by hand. That's because it takes skilled workmanship to create these elaborate, lacy designs. However, there are also many gorgeous pre-made settings featuring filigree, so you won't always see this cost increase. Choose a less expensive precious metal. Select a setting that isn't handmade. Pick a diamond or gemstone that is smaller or not as clear as more expensive options. Filigree rings come in a wide variety of styles and materials. Understanding the selection can help you choose a ring that's perfect for you. Art Deco Filigree Flowers and Wheat Diamond Engagement Ring - This stunning 14k rose gold ring from Antique Jewelry Mall has an elaborate filigree setting with a botanical motif. A 0.34-carat round brilliant diamond sparkles in the center. This pretty ring retails for just under $1,100. 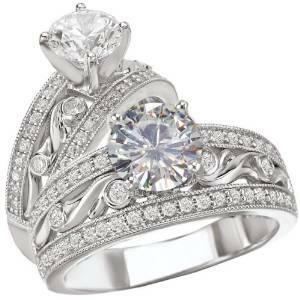 Vintage-Style Filigree Diamond Engagement Ring - Offering a bit of charming vintage style to the traditional diamond engagement ring, this spectacular ring form Amazon.com is a pretty choice. The 14k white gold band is made up of elaborate filigree and accented with small diamonds. A 1.5-carat, cushion-cut center diamond is the centerpiece. It retails for just over $11,300. Antique-Style Diamond Engagement Ring - This spectacular 18k white gold ring from The Marlene Harris Collection boasts elaborate floral filigree work surrounding a round diamond center stone. Even the prongs are part of the design, masquerading as flower petals. It retails for around $800. Antique-Style Moissanite Filigree Engagement Ring - A round-cut, 0.88-carat moissanite sparkles in the center of this beautiful ring from Amazon.com. 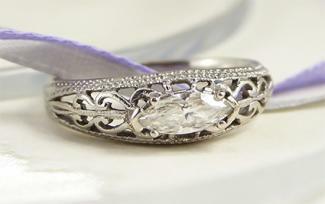 The 14k white gold filigree setting is set apart by the milgrain edging around the band. It retails for around $2000. Art Deco Blue Sapphire Engraved Filigree Engagement Ring - Offering an affordable and lovely choice for couples on a budget, this beautiful filigree ring from Antique Jewelry Mall is crafted from sterling silver. A 0.90-carat, lab-created blue sapphire glows in the delicate setting. It retails for $105. Antique-Style Aquamarine Filigree Engagement Ring - This beautiful floral filigree ring from The Marlene Harris Collection features an oval, 0.60-carat aquamarine supported by leaf-shaped prongs. The 14k white gold setting boasts flowers, leaves, and wheat. It retails for $650. Antique-Style Filigree Rhodolite Garnet Engagement Ring - This spectacular ring from Jan's Jewels is made from an original ring die from about 1900. The exquisite 14k white gold filigree setting supports a 0.50-carat rhodolite garnet. It retails for about $500. Ten Two Three - This retailer specializes in antique and vintage jewelry and has dozens of beautiful filigree designs with diamonds and other gemstones. Topazery - Another great place to find a huge selection of filigree rings, Topazery has a wide range of styles for every budget. Brilliant Earth - Along with selling new rings, Brilliant Earth maintains a great range of antique styles. 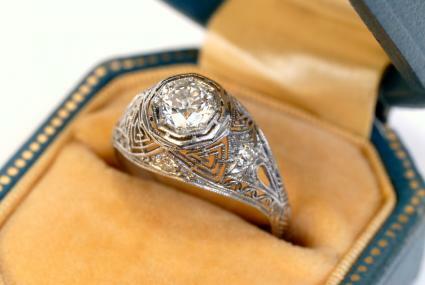 You'll find many filigree rings in their selections from the Art Deco era. Stellar Jewelry - With sections for platinum filigree rings and other antique filigree rings, you can find many beautiful antique designs at this shop. Whether you purchase a beautiful antique ring or a new ring featuring gorgeous filigree, you'll love the delicate, lacy nature of these stunning pieces of jewelry art. Choose a filigree engagement ring that fits your personal style and budget, and you'll have a design you'll love for the rest of your life.